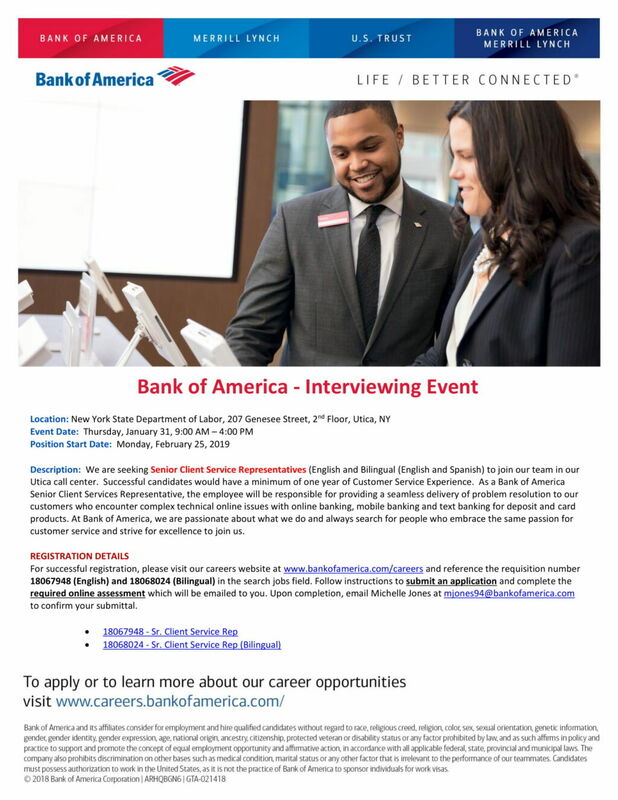 Bank of America will be interviewing candidates for their Senior Customer Service Rep-English and Bilingual (Spanish/English) on Thursday January 31st from 9 am to 4 pm. Description: Seeking Senior Client Service Representatives (English and Bilingual (English and Spanish) to join the team in the Utica call center. Successful candidates would have a minimum of one year of Customer Service Experience. As a Bank of America Senior Client Services Representative, the employee will be responsible for providing a seamless delivery of problem resolution to customers who encounter complex technical online issues with online banking, mobile banking and text banking for deposit and card products. At Bank of America, they are passionate about what they do and always search for people who embrace the same passion for customer service and strive for excellence to join them. For successful registration, please visit our careers website at www.bankofamerica.com/careers and reference the requisition number 18067948 (English) and 18068024 (Bilingual) in the search jobs field. Follow instructions to submit an application and complete the required online assessment which will be emailed to you. Upon completion, email Michelle Jones at mjones94@bankofamerica.com to confirm your submittal. Interviews will be held on January 31st 9 am to 4 pm at the Utica Career Center.